Learn foundational techniques for hat manipulation... great for use in dance, theater, magic, and more! As they can also be useful for costuming, warmth, and sun protection, hats are very practical and portable props for object manipulation, making them an easy thing to keep around for practice and casual play. Class will explore grips, body rolls, flips, flourishes, throws, and more. Purchase includes digital access to class notes and technique videos to help you retain and build on what you learn. Clean hats will be available for student use, but bring your own if you want! Open to age 9+ No experience necessary. This class will explore the social side of juggling and object manipulation through fun partner and group activities. No prior juggling experience required. Great for friends, couples, families, multigenerational bonding, and team-building. These exercises are also good for neurological stimulation and brain growth, stress relief, coordination building, and self-confidence. All materials will be provided. Open to age 8+ No prerequisites. Trevor Pearson (juggling, object manipulation) grew up in the town of Brewster, on Cape Cod. He's been juggling professionally for about 20 years, performing and instructing throughout New England, and beyond. 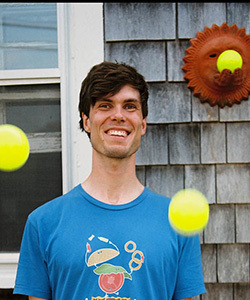 In addition to his instructional work with Payomet in Truro and Wellfleet, Trevor has taught juggling on Cape for Wellfleet Elementary, Orleans Elementary, The Laurel School. Chatham Middle School, Harwich Recreation, Nauset Youth Alliance, and the KABOOM and ECEC programs at Eastham Elementary, among others. Off-Cape, Trevor has recently led juggling and object manipulation workshops for Oberlin College, Tufts University, Rochester Institute of Technology, and Wildfire Spinning and Fire Arts Retreat.